Excellent location. Beutiful apartment, wonderful host. Exactly what we needed for our stay with the kids. Location was ideal! Facility was great for our family of five. The location was amazing. The house is actually under the bridge over Atrani - so on one side you have views of the sea and on the other side you have the town square. The house was exceptionally done up, clean and bright with utensils and amenities to even cook all your meals. Our host was there to greet us when we arrived and was super responsive and warm. We had an exceptional time - highlight of our trip so far. There are 4 - 5 restaurants just under the house and a mini super market under 50m. The town of Amalfi can be walked to under 10 mins via the pedestrian tunnel. The view from the room and kitchen was stunning! Just imagjne: wake up and see the deep blue sea and golden sunshine through the glass door of balcony! spacious and clean place for a family of up to five people! well equipped kitchen and very convenient. Host is very nice though can speak little English. Host's daughter can help a lot on communocation. restaurants is right 10 meters away. Location is amazing. One side a lovely square otherwise looks over the sea. Very clean apartment. I thought Atrani might be a bit far away from Amalfi but it's only 10min walk and closer than apartments that actually say they are in Amalfi. 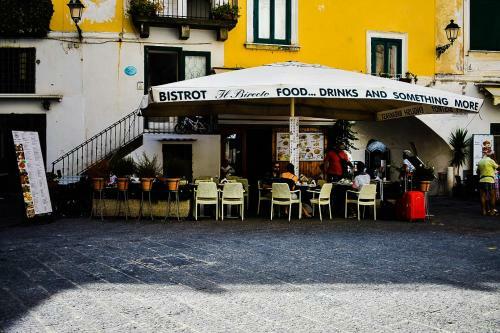 The square offers lots of restaurants and are 50% cheaper than Amalfi. Host is very helpful and friendly. Fruit,water and kitchen roll all waiting. Many things... beautiful beach view from kitchen, balcony and bedroom, modern amenities at the property such as washing machine, extra wc, iron, oven, gas stove, restaurants below, 10.min walk to amalfi promenade. Incredible location. #1 on the Amalfi Coast. Close to everything, but not loaded with tourists. I did a lot of research and was so pleased. Just amazing. All the local restaurants were wonderful, hiking (stairs, ie streets, wound everywhere) breathtaking and unlimited. I couldn't stop taking postcard perfect pictures. Amalfi Town close by-walking distance. Parking avail. between Atrani and Amalfi (probably only parking structure on entire coast!) Take ferry for a nice day in Positano or other towns. Wished we could've stayed longer. And this holiday house was such a treat. I wouldn't change anything! Lock in a great price for Casa Rosaria – rated 9.7 by recent guests! 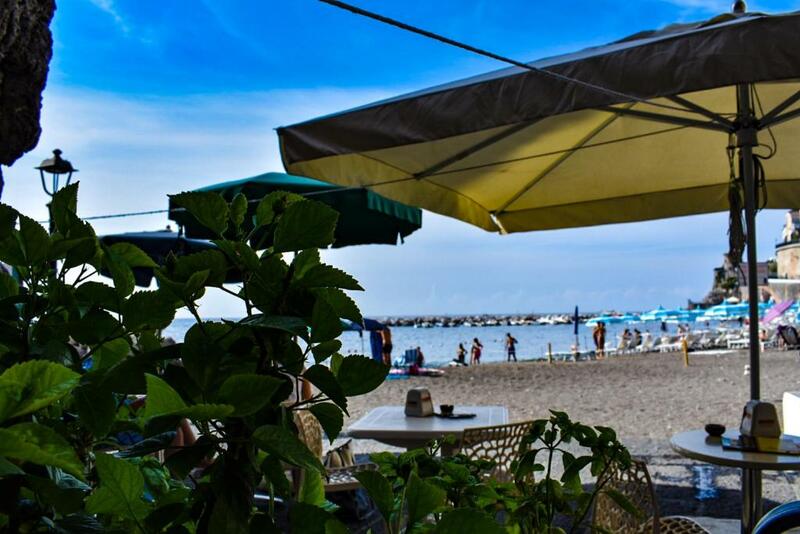 One of our top picks in Atrani – and a guest favorite. Located in Atrani, Casa Rosaria provides air-conditioned accommodations with a terrace and free WiFi. With sea views, this property has a balcony. This vacation home with city views features a bathroom with a bidet, shower and a hair dryer. A flat-screen TV is offered. Sorrento is 20 miles from the vacation home, while Salerno is 16 miles away. The nearest airport is Capodichino Airport, 40 miles from the property. 뀐 Located in the top-rated area in Atrani, this property has an excellent location score of 9.8! When would you like to stay at Casa Rosaria? This holiday home has a balcony, seating area and view. Soggiornare a casa Rosaria è unico per il semplice motivo che vi trovate senza uscire di casa sia in spiaggia che al centro del paese con affacci unici.E vi offre tutto quello che avete bisogno per una vacanza indimenticabile. Amo la mia zona, mi piace conoscere persone nuove e con un unico obbiettivo far stare bene i miei ospiti. 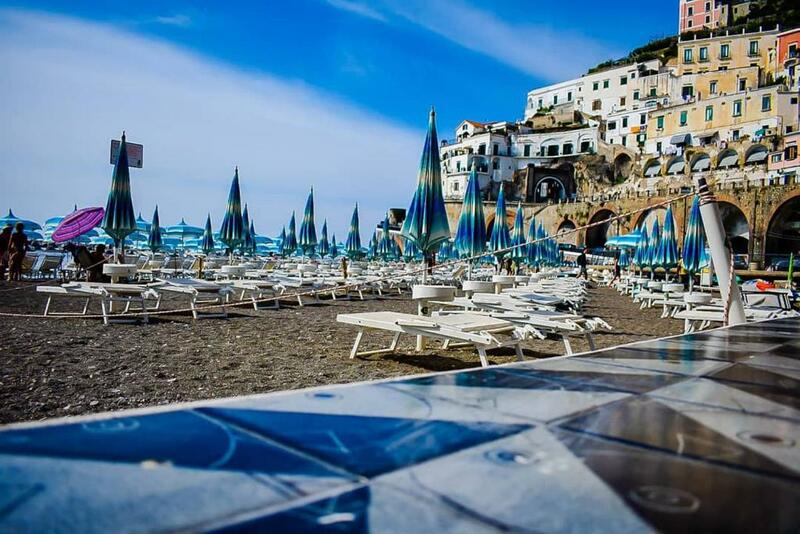 Atrani è il comune più piccolo d'italia come estensione, unico nel suo genere con la spiaggia più tranquilla della costiera. Attaccato ad Amalfi e a pochi chilometri dalle località più rinomate della costiera amalfitana. House Rules Casa Rosaria takes special requests – add in the next step! Please inform Casa Rosaria of your expected arrival time in advance. You can use the Special Requests box when booking, or contact the property directly using the contact details in your confirmation. It will be great if the water heater can provide more hot water for second person to take a shower at night. We only wished there was a more central spot in the apartment for the family to hang out together. Either a bigger couch in the entry (or 2) or some other option. There are 4 rooms in the place which are spacious and great, but no where for a family to just hang out together other than at a kitchen table. We absolutely loved the location. Right in the centre of town, right in the piazza. It has a very homey and local, Italian feel. 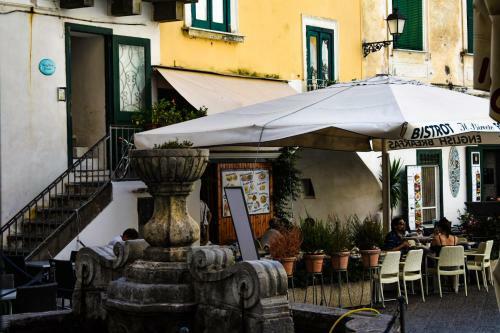 As you walk into the apartment you realize that on one side you’re overlooking the charming square (piazza) and on the other your windows open to the view of the sea and the sound of the waves. It’s so magnificent to fall asleep and wake up to the sound. It’s the best of both worlds. It’s incredibly central with a parking lot (underground €13/day in the off season - november) about 3-5 minute walk, 2 grocery stores right on and off the squares, many restaurants and good ones to choose from (even in the off season) and you’re only 5-10 minute walk down the street and through the tunnel next to the parking lot to Amalfi if you’re looking for the tourist experience. 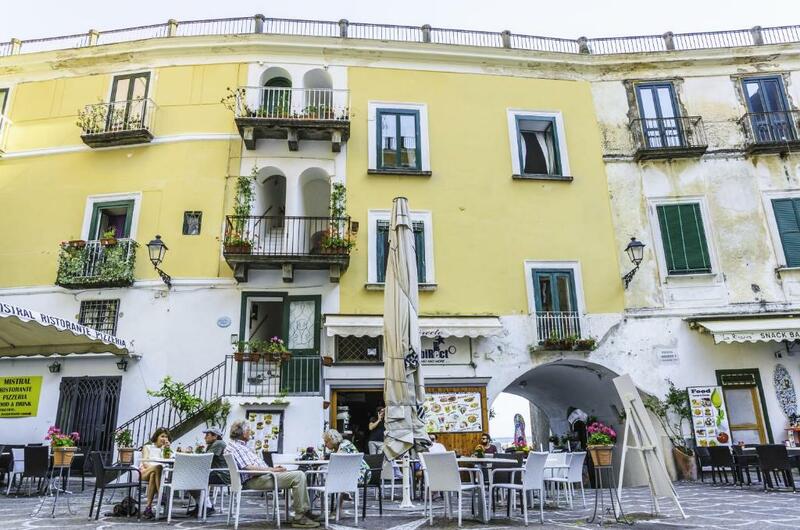 In the off season you’re going to witness the real Italian experience in the town of Atrani with the most picturesque setting, a beach and the nicest people. The host was great. With limited English, but enough to communicate. Very accommodating. We could do laundry for our family and shop at a local butcher/grocery store (La Bottaga del gusto just 20 min up the street from the piazza) for our groceries to be able to make a great family meal right in the kitchen. 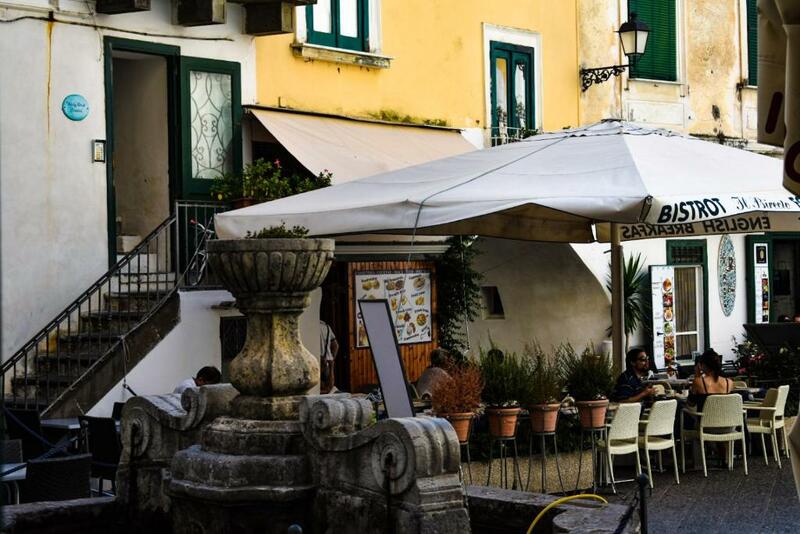 The restaurants in the piazza are amazing with great local food and seafood. This property is absolutely excellent! We walked into the room and the host was very kind to show us all around. The property itself is very spacious and has everything you could want, including some teas and coffee, dish soap, plenty of toilet paper and paper towels. The doors to the property were open with the sound of the waves rolling right into the apartment....heaven! The host was very kind and even included a fruit bowl and some drinks in the fridge that our family devoured. This property is steps to the beach and the restaurants in Atrani are MUCH less expensive than those in Amalfi or Positano and we found the food and service to be much better! The best meal of our trip was at Ristorante Il Veliero, just downstairs from the room. Parking was very close by at a parking garage and was reasonably priced. 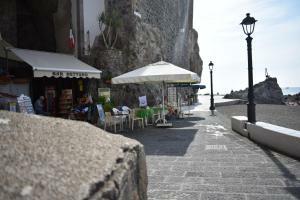 The walk to Amalfi was very easy through a tunnel near the Luna Rosa parking garage. We expected a lot of steps, having been in this area before, but the walk to Amalfi was VERY easy....making public transport and ferry access much easier to other locations. I would stay at this exact property again in a heartbeat and will recommend it to my fellow friends. The access via narrow steps with luggage. Beds were not comfortable - rooms were very cold on the first nights stay although heating helped thereafter. There was quite a bit of noise from early morning but guess that comes with great location in a small town. If you drive, take it slow (expect winding roads that often fit 1 car comfortably elsewhere, but here two way traffic with buses, parked cars in one lane, people walking (no shoulders or sidewalk), blind curves etc are common. Not an issue with the property, but would be nice to know. Also, get in shape. The stairs and walks are amazing. Do not bring roller bags, backpack it! Loved out stay here. Sergio is a very nice friendly Italian who goes out of his way to make your stay comfortable. We loved Atrani and we are very glad we stayed here and not in Amalfi as there were so many tourists in Amalfi. The apartment was a walk up a couple of flights of stairs but my fault for having a heavy bag! A large, bright and airy apartment with views to the beach and into the square with shops and restaurants at your feet. We were very pleased to have chosen Atrani as away from the crowds of other more popular towns but a short walk into Amalfi. Only wish we could have stayed longer. Our host Sergio was very friendly and greeted us on arrival. Hardest part was bringing our suitcases up the stairs. We should have packed lighter! There was nothing that we didn't like. Some people have mentioned the noise from the beach or the piazza. Yes there was noise, but we enjoyed listening to the vibe of the piazza or the beach and at night when we closed the doors and put the air con we slept undisturbed. Casa Rosaria was a perfect little apartment for my husband and I, although it could have accommodated at least 2 more adults and children. 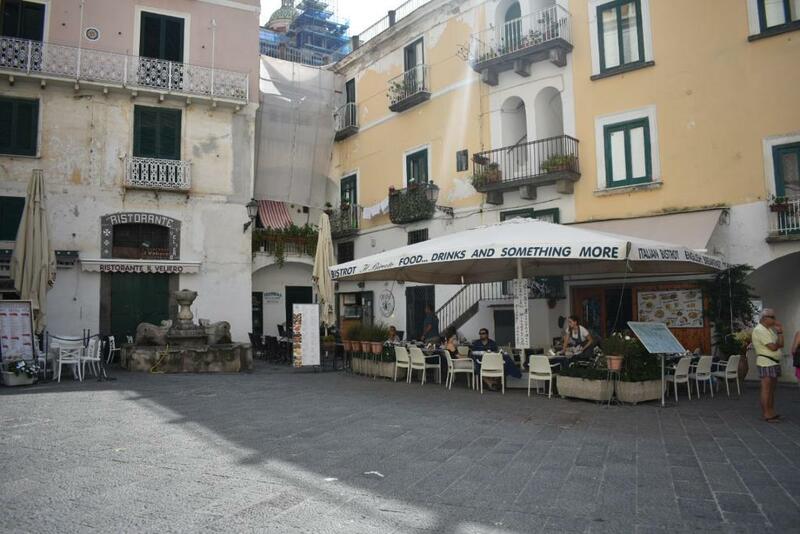 The location was fabulous, right in the Atrani Piazza and facing the beach with lovely views. Sergio was a great host, easily accessible and met us at a restaurant right under the apartment. He also was easily contactable by phone or email. Sergio also introduced us to two lovely people in the Piazza, Donello ( I hope I have spelt that correctly - who runs his families fabulous restaurant right downstairs from the apartment) and Filomena who runs the boutique across from the hotel, so that we had someone to contact if we had questions or needed to find something in the village. What delightful people they all were, so friendly and helpful. When we arrived, Sergio and Donello helped us to carry our bags up the two flights of stairs. Waiting for us in the kitchen was a bowl of cold juicy oranges and lemons. It was a very hot day and they were very welcomed and delicious. The apartment had lovely views, was very clean, a big double bed - which was firm but we slept well. We were travelling for 6 weeks so to use the washing machine was a godsend for a few days and to cater some of our meals with fresh produce from some of the local stores was a bonus too. The apartment was stocked with some basic supplies such as salt, pepper, sugar, oil and cling wrap, all very handy for short stays. It also had two beach towels that could be used, which again was fabulous. I will certainly recommend this to any of my friends visiting Atrani. The apartment was exactly as appeared on booking.com. Thank you Sergio!